Why join a car club? It's a reliable networking tool to find cars, parts and restoration resources. And, you can't find information about these rare cars in any old car magazine. 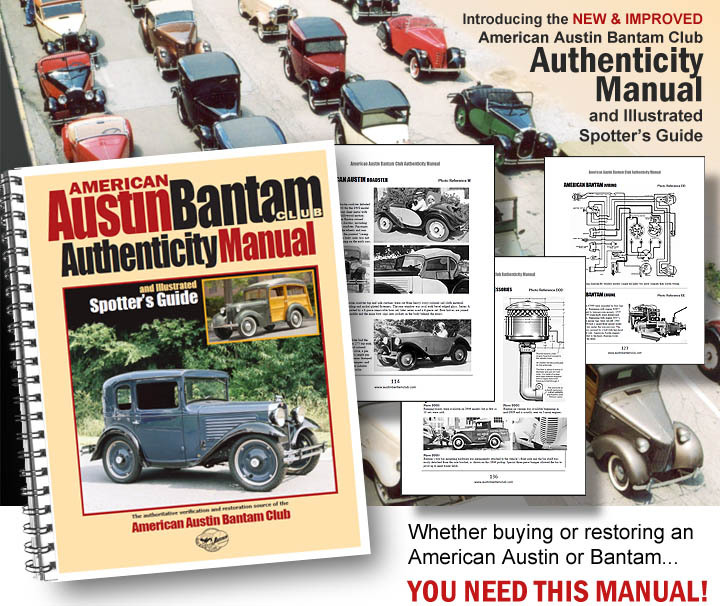 Six times a year, the club publishes the American Austin Bantam Club News, an award-winning newsletter chock-full of history, restoration tips and other related topics. In 2016, we released the updated AABC Authenticity Manual, which continues to be a popular item among restorers. AABC Member Discounted Price: $40 each for shipment with U.S.A.
Canadian orders, add $17. Foreign orders, add $26. 2016 edition. 150 pages. 8 1/2" x 11" soft cover, Wire-O-Bound book. Full color cover. Inside pages black & white, printed on both sides. Devoted exclusively to the American Austin and Bantam built in Butler, PA between 1930 and 1940. Information came from blueprints, inspection records, sales/service bulletins and advertising. Data is categorized into hundreds of text-filled reference tables to document model differences, body panel details, upholstery, paint colors, pin stripes and accessories. Sections include frames & wheels, engine & transmission, interior components, model & production figures, descriptions of each model and more. Members wanting technical specs are urged to consult period automotive manuals. 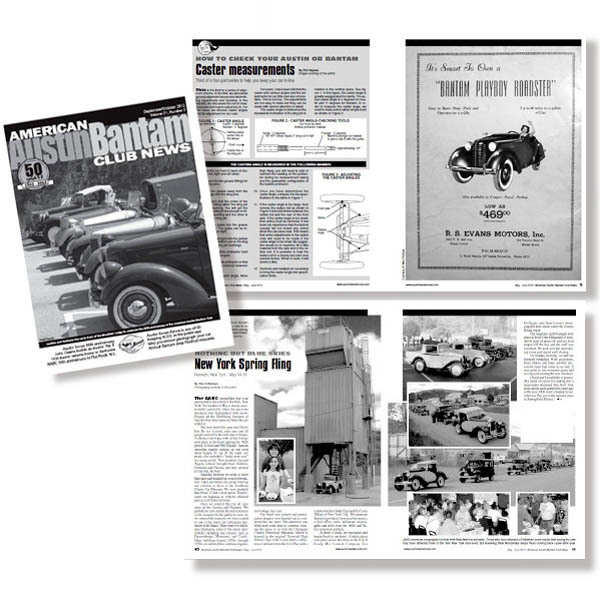 Since 2000, Old Cars Weekly has presented its Golden Quill Awards to the American Austin Bantam Club News. The editors fill its pages with just the right balance of entertainment, education, large clear photographs, original technical drawings and vintage advertising. The newsletter is published six times a year and is mailed to every AABC member. The club offers a number of technical articles written by club members sharing what they have learned while restoring their cars. The club also offers some reproduced literature.